Fashion Retail is adapting it´s business model at the pace of digitalization. As Darwin said, it is the most adaptable to change that will survive. After reading IESE insight “5 Building Blocks for Cyber-Physical Value Chains”, from Professor M. Sachon (Issue 33, Second Quarter 2017), I decided to start writing a series of articles about Fashion Technology: the business of fashion in the Digital era or Fashtech. This is the first one: Artificial Intelligence for Fashion Retail. Customization: customers want a product adapted to their specific requirements. Financial Markets: institutions are still recovering from the 2008 financial crisis and volatility is the new normal for the markets. Fashion retailers will need to face unpredictable exchange rates, apart from political volatility and climate change. Sustainability concerns: energy efficiency, waste reduction and responsible use of natural resources have become priorities. Read more about Sustainable Fashion best practices, from fashion retailers and etailers. Information society: in a connected world, new ideas spread rapidly, accelerating the development of new products, processes and business models, and generating difficult-to-serve demand peaks (e.g iPhone). Globalization: vast, interconnected supply chains and markets are spread all over the world, increasing management complexity. Retailers were some of the first global explorers (took profit from colonization from western countries during the XIXth and XXth century) and have adapted their products to different customer behaviors and tastes. Fashion is an industry that adapted very well its business model to globalization. Brands like Inditex or H&M, for example, organized their supply chain to respond to their core value proposition while opened hundred of stores worldwide. Although they globalized successfully, the HOW is different. Inditex integrated most part of its supply chain, owning part of its production capacity and designing in-house (with a perfect alignment with the latest trends and being inspired by top fashion houses) the trendiest garments. The result is a supply chain network, close to what are platforms nowadays, where basic products are made off-shore and fast-fashion items near shore. H&M didn´t bet for integration and its business model is based in outsourcing its production and make great marketing collaboration with top designers like Karl Lagerfeld or Humberto Leon and Carol Lim. See more details of capsule collections in Capsule Collection in Fashion. Fashion retailers´customer-centric business understanding, and its processes like seasonal collections and fast-fashion, trends hunting, demand forecasting, store clustering, supplier network management (quality, samples, lead times…), store layout definition, amongst others have been studied and applied by other industries that went into retail. This is the case of Apple, for example. Fashion retailers, and retail in general, are the best positioned to respond to digitalization because they are close to the customer. And, Digitalization is empowered itself by how customers are using technology. Retail is changing at the pace of technology and digitalization. Companies like Walmart, Amazon or Nike are acquiring tech startups specializing in AI, VR, AR, blockchain, etc. (Read more about latest acquisitions from Amazon and Walmart, or Nike´s Direct Consumer Offense). LVMH launched its startups accelerator Station F (see below, Heuritech, a startup that is part of Station F) and Farfetch partnered with Burberry and 500 startups to launch Dream Assembly. How AI is impacting in the fashion retail industry? According to Wikipedia, Artificial intelligence (AI, also machine intelligence, MI) is intelligence demonstrated by machines, in contrast to the natural intelligence (NI) displayed by humans and other animals. As a retail consultant, I have seen how Analytics capabilities have been growing as fast. Top leading clients are investing in new capabilities (not only tools and systems) related to machine learning, AI, blockchain, Internet of Thing, RPA, amongst others. Regarding Fashion retail, IBM has teamed up with Tommy Hilfiger and The Fashion Institute of Technology (FIT) Infor Design and Tech Lab on a project called Reimagine Retail to demonstrate how AI can help expedite and enhance the design process. Steve Laughlin, general manager of IBM Global Consumer Industries explained on Forbes that “AI can assist design teams by enhancing and reducing overall lead times, and expand their creative discovery by analyzing and remembering insights from thousands of images and videos using computer vision. Also, designers can detect how they can integrate trending colors, key patterns, and styles”. What are the benefits of AI for the Fashion Retail industry? Customer Experience & Customization: Algorithms track customers journeys and help them to find the right product. It´s like Netflix machine learning system that shows you what could you like according to your previous choices. It´s about the merge between the Long Tail, from the Supply side, with the Segment of One (read Diversification and Segmentation in Fashion Retail: the I-Profile segment), from the Demand Side. For example, Otto Group and Blue Yonder are using AI to improve Customer Experience. Customer Service: Real-time communication via chatbots or touch screens. Robots located inside stores help customers locate items and also answer basic questions. See here Macy´s On Call service. Design & Buying: AI analyses trends and customers´behavior. This information will be very useful for designers or buyers when creating new collections, selecting colors, styles, etc. Demand Forecasting & Planning: Planners will have better information to plan the right quantity, at the right time, in the right place (e.g. Allocations, Clustering, etc). Operations Automation: AI enables autonomous decision-making, from observing and strategizing to deciding. Grabit, for example, provides manufacturing support through the use of automated robots and machine learning software. Supply Chain inventory management: Real-time inventory tracking (e.g. with RFID), warehouse management or operational procurement. FINERY, an automated wardrobe planning platform that utilizes predictive analytics for offering personalized shopping recommendations for women. Finery captures all customer´s past purchases and organizes them into an online wardrobe. Then, creates looks from the customer´s personal wardrobe or from over 10,000 shopping sources. TRUEFIT provides an online fit recommendation engine that helps consumers to find brands and new styles on the market. STYLUMIA is a fashion intelligence startup that analyses and derives actionable intelligence from unstructured data sources by applying advances in AI and Computer Vision. The source of its intelligence is images, user behaviour data, textual descriptions on social media and implicit signals mined from retail sites. The result is that fashion and lifestyle professionals across the globe are able to make laser-edge informed decisions for current course corrections and future directions. HOOK is an AI-driven search & discovery platform for fashion products. Thru the app, you can track real time trends (interestin from a planning and assortment point of view). Hook also allows to see what people are searching for like specific keywords, navigation patterns, price points, etc. And finally, Hook’s sophisticated Similarity Engine permits to track the exact and closest matches to your product, making it a powerful tool to establish competitive differentiators. HEURITECH is an artificial intelligence platform that can predict fashion trends based on the deep analysis of millions of images shared every day on social media by influencers and consumers. Heuritech gathers millions of social images each day, or plug in on social listening tools to form a wide-ranging and representative panel. Then, after collecting data, it refines it and uses image recognition technology to uncover millions of untagged posts displaying brands’ products and to tag all fashion related elements inside images. This french startup is part of Station F.
VUE.AI is a retail industry’s artificial intelligence platform that promises Intelligent Retail Automation, keeping the human experience front and center. 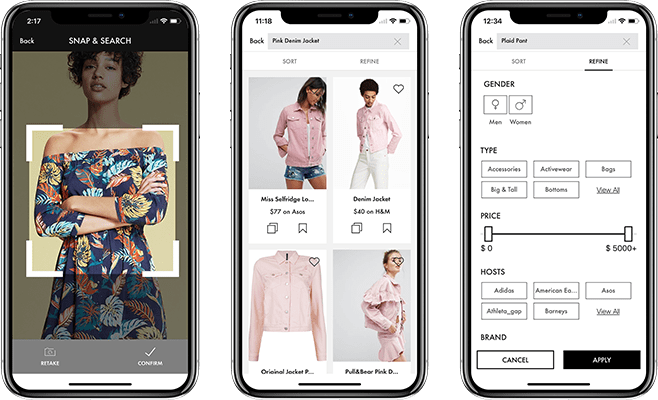 Using Image Recognition & Data Science, Vue.ai extracts retail catalog data and analyzes it with user behavior, helping retailers make better, faster decisions. The platform delivers on 2 primary value propositions: Automating retail processes across catalog management & merchandising, saving resources and significantly reducing the time to market; and personalizing the customer experience across channels, enabling brands to differentiate and grow. GRABIT provides electroadhesion-based gripping products for robotics and material handling applications in logistics, aerospace and assembly industries. Stackit™, one of its products, is an auto-layering robot with an electroadhesive gripper that has limitless flexibility –– easily stacking materials like leathers, meshes and composite fibers. Industries as diverse as aerospace and apparel already use it to automate in ways they never imagined (Nike is one of its investors). SNAPS is an online platform that empowers brands to provide personalized ecommerce, proactive support and engagement, creating a wholly unique brand experience for each customer. Snaps platform has evolved to help brands find new customers and increase lifetime value through chatbots, voice skills and social messaging. STITCH FIX is an online personal stylist retailer that delivers user customized clothing and accessories. The customer fills a style profile and a personal stylist will hand pick pieces to fit his/her tastes, needs and budget—and mail them directly to their door. Each box contains five items of clothing, shoes and accessories to try on at home. Customer keep what the want and shipping and returns are free. THRED UP ´s Goody Box is a box you order (customers need to answer 15 questions regarding size, fashion style, budget,.., in order to receive a customized box filled with discounted items (secondhand garments) with no commitment and free return. Then a machine learning algorithm analyses customers shopping preferences (what they return and/or keep) with the aim of improving the next offer. More data equals a more accurate and customized box, increasing sales revenues per customer and more margin (lower returns, lower reverse logistics costs). ALIBABA FashionAI The Vision & Beauty Team, Alibaba Group and Institute of Textile & Clothing, The Hong Kong Polytechnic University announced that they are co-organizing the FashionAI Global Challenge 2018. The world’s first FashionAI Global Challenge offers RMB 1.34 million prize pool, inviting participants to solve the imminent issues on the application of AI in fashion. FINDMINE is a retail technology that uses machine learning to scale the manual process of product curation for online merchants. BOLD METRICS is a SaaS solution for retailers and brands to gather intelligence about their customers and personalize the online apparel shopping experience. By deploying a comprehensive set of machine learning and data science technologies for accurately predicting body measurements, we enable retailers, brands and innovation enthusiasts to unlock human body day to meet the demands of today’s increasingly personalized world.